Koch International has modernized their telematics with TIS and Honeywell. The results include a partially automated expense report and a comfortable presentation of driving and rest times, from which the drivers benefit. Communicating in seven languages: For dispatchers at Koch International, this diversity is part of everyday life. It is supported by the telematics solution TISLOG office, which since 2017 automatically translates every text message between the dispatcher and company drivers as well as drivers working as contractors. For this, the national language of the assigned driver was stored in TISLOG office for each terminal. 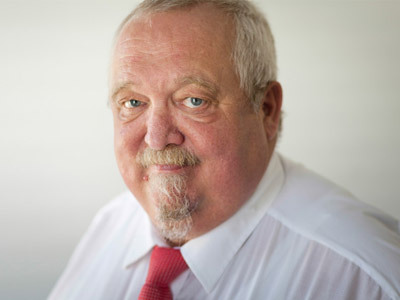 "This feature has greatly simplified the collaboration and ensures a high level of acceptance of the new telematics solution on both sides," explains Heinz-Peter Beste (right photo). 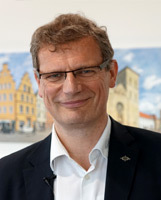 As a member of the executive board of Koch International, he is responsible for the IT department of the traditionally Osnabrück-based company. In 2016, the decision was taken to replace TIS's PSV3 telematics system, which had been introduced at Koch International in 2002, and also to renew drivers' mobile equipment. Part of the project goals was a partly automated expense report and a comfortable display of available driving times for dispatchers and drivers. 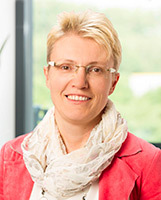 "We were open to all providers and have tested various offers," recalls Beste. While Honeywell prevailed against the former supplier of mobile computers, Koch decided to continue the longtime relationship with TIS as a telematics expert. "In addition to our very good experiences, the TISLOG mobile Enterprise solution, which has been programmed from scratch, convinced us as the successor to PSV3," emphasizes Beste. In contrast to PSV3, which was designed for mobile devices with the Windows Embedded 6.5 operating system, TISLOG works independently of hardware on all mobile devices with Android and HTML5 browsers. In addition, even old Windows devices can easily run in parallel operation, which means that the hardware could be exchanged in several steps. Parallel operation is ensured by the server services offered in the TIS computer center, which are grouped under the name TISLOG office. TISLOG office acts as an online interface for the telematics data from the mobile end devices. The data can be processed directly in an online portal or automatically transferred from there to the transport management system (TMS) used by Koch International. In terms of selecting the new mobile devices Koch International relied mainly on the opinion of the TIS practitioners. A group of eight drivers with different technology affinities had the opportunity to thoroughly test three different devices over a period of six weeks, including a tablet. "Before the test, everyone wanted the tablet, which did not surprise us because of the large display," says the deputy fleet manager Rena Markmeyer (right photo). However, at the end of the test phase, all testers unanimously chose the Honeywell ScanPal EDA50 with integrated scanner. The holder developed by TIS with charging function for fixing the EDA50 in the truck rounded off the good impression. An Android app developed by TIS is running on each device. It depicts the entire workflow of short-distance and long-distance traffic, right through to integrated truck navigation, depending on the area of ​​application. Even the requirements of Heinrich Koch Internationale Umzugs- und Archivlogistik (relocation & archive logistics) are met by the flexibly configurable app. "The solution was adapted to the different requirements of our fleets," emphasizes Markmeyer. For example, some drivers have access to a shipper app, while another group can make calls with the EDA50 using the truck's hands-free system. In another sub-fleet, the reversing camera of the vehicles was integrated into the app. "For the EDA50, the compact dimensions were particularly helpful, while the tablet proved too bulky," explains Markmeyer. After all, the drivers have to take the mobile computers out of the vehicle at each stop, so that the customer can sign on the display. This is where the 5-inch touchscreen of the EDA50 impresses, which is also operable with wet hands and easy to read in difficult outdoor and indoor lighting conditions. While the mobile end devices were newly acquired, the second hardware component of the telematics solution was already in place: For the transmission of the telemetry data as well as the driving and rest periods all newer trucks of the own fleet have permanently installed truck boxes. These are connected to the FMS interface of the vehicle and to the D8 info interface of the tachograph and send their data directly to the TIS server. Even back at PSV3 times, Koch International was able to evaluate the diesel consumption, the previous total fuel consumption, the tank level, the route to the next inspection, engine temperature, position of the accelerator pedal and the operating frequency of the clutch and brake. Overall, this results in a profile with which the driving behavior can be specifically optimized. In addition, the Truckbox seamlessly transfers the expenses-relevant working hours as well as the driving and rest times, which are analyzed and graphically processed via TISLOG. This allows the time budgets of all drivers before and during the tour to be planned reliably and monitored promptly. If driving time threaten to be exceeded it can be detected in good time and related penalties can be avoided. The currently available driving time is displayed not only to the dispatcher, but also to the drivers. With the help of the menu control of the TIS logistics app, the drivers can get to their desired information much faster and more comfortably with their EDA50 than with the tachograph's less user-friendly button selection. "With this function alone, our drivers do not want to miss out on the telematics solution," says Markmeyer, adding: "The acceptance of telematics by the drivers has completely turned around." Payroll accounting, however, also benefits from the availability of working hours, driving times and rest periods, which now only have to manually enter the times for the expense report in special cases such as a passenger. TISLOG not only partially automates the expense report, but also makes it more transparent. At the end of the month, the current data is also made available on Koch International's employee portal, whereby drivers can access their data in two ways. Most commonly used is a specially designed app that has been installed on the driver's phones. In addition, for the drivers in the branches a PC with printer is available to - if necessary - print the statements themselves. As a further step in the consistent digitalization, Koch International decided to integrate the semitrailers into the telematics solution as well. As part of this, 112 of the 174 trailers have already been equipped with their own trailer box, which above all transmits their current position data to the TISLOG server. In conjunction with the tractor's GPS signal, the system automatically recognizes which vehicles are currently hooked. The respective combinations are displayed to the dispatcher together with the current position in the online portal of TISLOG office. Independently from the trailer solution, the GPS data in conjunction with the Transport Management System (TMS) is also used to calculate the Estimated Time of Arrival (ETA). TISLOG office can compare the vehicle position with the planned values ​​of the respective tour. "The basis for this is the geocoding of the delivery addresses carried out by TIS, which can thus be displayed in the shipment monitor on a map," explains Beste. Should there be any delays, the responsible dispatcher will be informed in good time via TMS who can then notify the customer or take other measures. Conclusion: The switch from PSV3 to TISLOG has opened up new ways for Koch International to achieve continuous digitization, from which drivers will benefit as well. They were integrated in the processes with the help of the EDA50 from Honeywell and the TIS logistics app installed on it in the best sense and have become true fans of the solution. The Heinrich Koch International Spedition GmbH & Co. KG is a medium-sized family business with over 700 employees, 12 locations and a logistics area of ​​approximately 70,000 square meters. The fleet of the CargoLine partner based in Osnabrück comprises 108 own trucks, 512 swap trailers and 174 trailers. 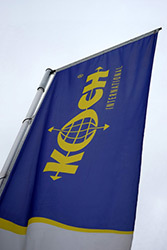 In addition, 271 vehicles are used by hauliers for Koch International. The history of the traditional company goes back to the year 1900. At that time the company was founded by Heinrich Koch. With Heinrich Koch jun. still a member of the founding family is active in the management. It is reinforced since 2009 by Heinz-Peter Best and Uwe Fieselmann. 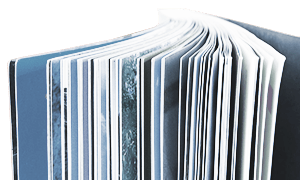 Koch International generated sales of EUR 129 million in 2017.